If you know me at all, you know I love eggs. WITH the yolks. When I hear people order egg-white omelets because they’ve been told the yolk is “fattening” or “full of cholesterol,” I cringe. 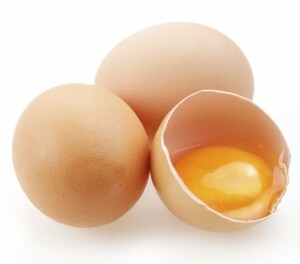 Yes, the yolk contains saturated fat and cholesterol. But no, that saturated fat is not bad for you. And the cholesterol is essential. I’ve talked at length about how saturated fat in itself is not the enemy, and our society’s saturated fat stigma is killing us. Despite the fact that saturated fat has actually been shown to reduce cardiovascular risk, our misguided experts are still telling people it’s going to increase that risk. And they’ve got no real evidence to back it up. While, at the same time, they’re still recommending low-fat foods that are filled with carbs and sugar. This is absolutely destructive. And don’t get me started again on all that is wrong with the great cholesterol myth, which I’ve written about at length (for the full story, see my feature editorial report The World’s Easiest Heart Disease Cure. A recent study has found that eating cooked whole eggs along with raw vegetables can increase the absorption of carotenoids. Carotenoids are antioxidants that give fruits and veggies their bright pigment. Examples are beta-carotene, alpha-carotene, lycopene, lutein, and zeaxanthin. I’ve written before about how they’re serious cancer-fighters. In this new study, 16 healthy young men ate three versions of a salad — one with no egg, one with 1 ½ scrambled whole eggs, and one with 3 scrambled whole eggs. All of the salads contained tomatoes, shredded carrots, baby spinach, romaine lettuce, and Chinese wolfberry. Those who ate the highest egg amount with the salad increased carotenoid consumption by three- to nine-fold. That’s seriously significant. By the way, don’t skip the (full-fat) dressing on that salad. I’ve noted research that shows dressings that are rich in monounsaturated fat (like macadamia nut oil) also help the body absorb more nutrients. That sugar-laden goop known as nonfat dressing won’t ever do that. Federation of American Societies for Experimental Biology (FASEB). “Consuming eggs with raw vegetables increases nutritive value.” ScienceDaily. ScienceDaily, 29 March 2015. <www.sciencedaily.com/releases/2015/03/150329141005.htm>.